While we’re on the subject of CBGB, here’s a heads up: Marky Ramone, who replaced the late Tommy Ramone as the band’s drummer in 1978 and went on to play with them for 15 years, will be supporting his forthcoming memoir, Punk Rock Blitzkrieg, with a trio of appearances. Last night Stoli vodka brought Andrew WK to a shindig at the Pyramid Club – part of a marketing campaign celebrating/commodifying Avenue A that also includes a Tumblr highlighting institutions like Lucy’s and A-1 Record Shop. 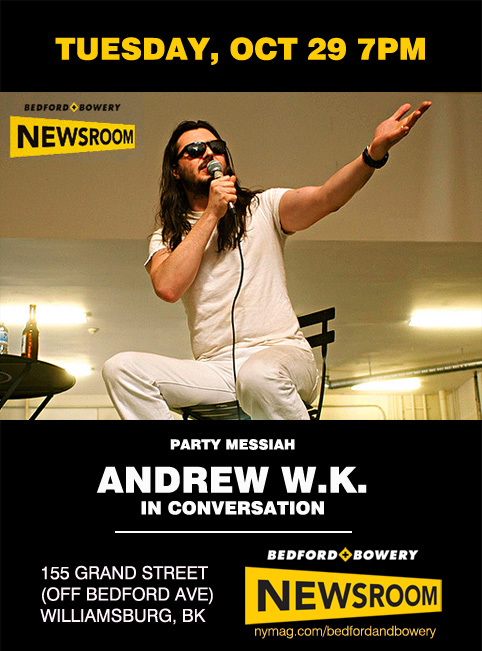 Before he ascended to the divine status of Real-Life Party God, legendary party-rocker Andrew W.K. was just an anonymous regular eating Thai food alone at Amarin Café. From 1998 to 2001, he lived first in Williamsburg and then in Greenpoint, where Amarin opened in 1997 in a space that was formerly a Chinese restaurant. Before social media, Valentine’s Day was an occasion for couples to show their love to one another via handwritten notes, chocolates, Hallmark cards and roses. Now it is an opportunity for couples to show the world how vomit-inducingly in love they are whilst reenforcing how crappy and meaningless and empty our lives are by comparison.